On our final days in South Africa, we returned to Cape Town. The weather was beautiful and the wine country of South Africa is gorgeous. We simply had to detour down to the coast to see the Southernmost Tip of the African Continent. It's another popular photo spot, but nothing like the crowds at Cape of Good Hope. 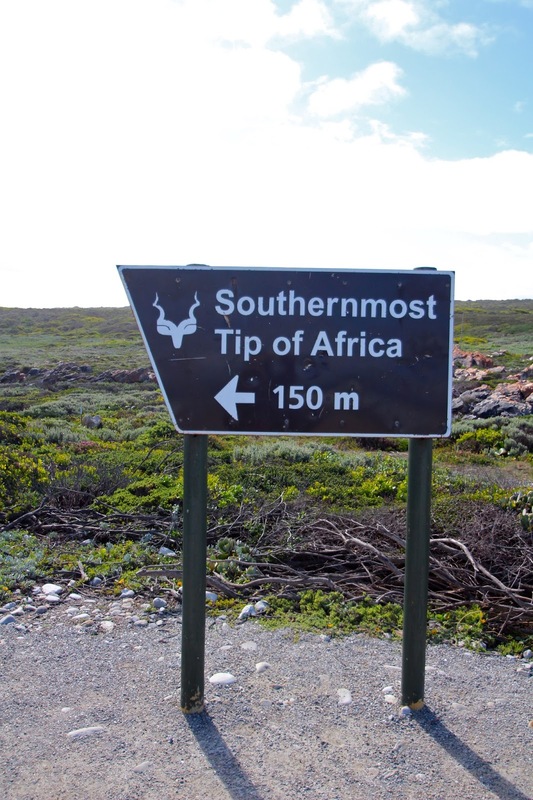 This is the meeting point of the Indian and Atlantic Oceans. 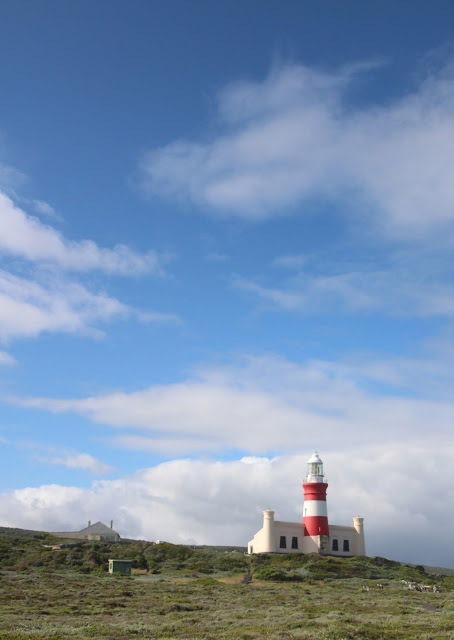 The town is cute and quaint, called Cape Agulhas, and it has a little lighthouse. There's a lovely little harbor there. We made a few stops in some popular whale-watching towns but unfortunately were not lucky enough to see any whales. We did have a great time though, we had a spectacular sunset and only hit a little bit of traffic at the end of the journey. The next morning we decided to try to catch a little bit of Table Mountain and Signal Hill before we headed to the airport. Returning the rental was a breeze, and we set off on the long journey back home. Cape Town as seen from Table Mountain is shown above and below. Cape Town and Table Mountain as seen from Signal Hill is shown below. We flew South African Airways and Virgin Atlantic on this journey. I do like foreign airlines so much more than airlines based in the US. The service is almost always better (more courteous, more attentive, more generous) and the planes usually have in-flight entertainment controlled by individual passengers - a screen on the seat back of the seat in front of you allows you to peruse what is usually a huge amount of diverse TV, movies, games and music. These little screens can make all the difference in the world on flights lasting linger than 8 hours. Airlines flying on long-haul flights also often keep a cache of snacks and drinks for the passengers back by the restrooms, and they are usually out for self-service. I like to get up and move around a little bit, not often but once or twice during a long flight, and I take a walk back there and have a quick drink of juice or a bite of fruit. I'll add a note here about the airport 'capsule' hotel we stayed in - Yotel - which actually was on the way from the US to South Africa, but nonetheless deserves a mention. These places can be really awesome. On a weird layover in between really long flights they can make a tremendous difference between having a pleasant journey and arriving rested and excited, and having a taxing journey and arriving like the walking dead. We've stayed in an airport hotel before - and I literally mean a hotel inside the airport - and they are set up in a very interesting way. There seems to be a maid staff on duty 24/7, they charge by the hour, and while some do not have bathrooms inside the rooms, the provide places to rest and get clean before continuing on. Personally, I don't think I'd overnight in a hotel like this; if the layover is more than 18 hours, it's worth it (to us) to leave the airport and get a hotel in the city (which we did in Dubai.) But for those short stays - like around 6 to 16 hours - they are a great respite.